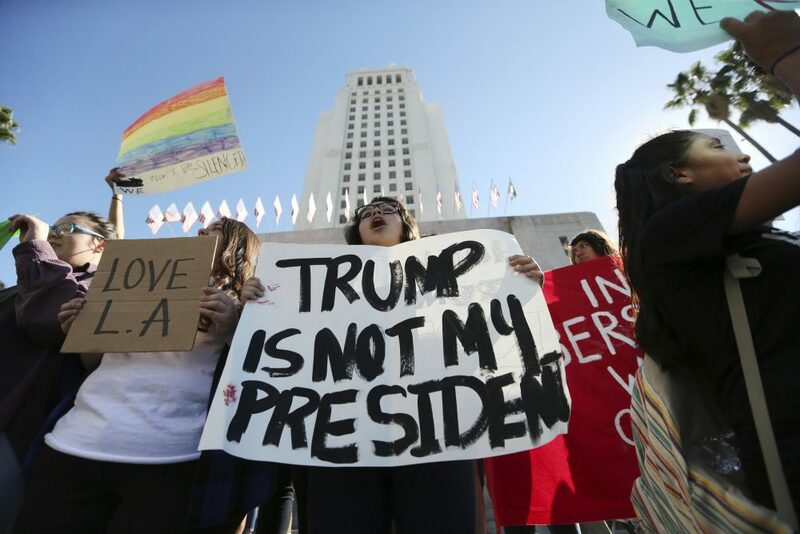 Students from several high schools rally after walking out of classes to protest the election of Donald Trump at City Hall in downtown Los Angeles, Nov. 14, 2016. Photo by Reed Saxon/Associated Press. Is California to blame for Donald Trump? That may seem a preposterous question to ask of a state that voted so decisively against the new American president that it was responsible, all by itself, for his loss of the popular vote. It seems even stranger given California’s near-total resistance to Trump’s presidency, and the way our state embodies so many of the good things—diversity, immigration, international cooperation, and science-based policy—that Trump and his acolytes rage against. Yet, there has been some finger-pointing at California—by both opponents and allies of the president—as the place that produced Trumpism. The case starts with some hard geographic facts. Twitter, which the president uses to spew bile, is a California creation. Reality television, which turned the real estate developer into a national entertainer, is a Hollywood gimcrack. And Breitbart—the alt-right media entity that modeled the toxic mix of xenophobia, authoritarianism, and conspiracy-mongering that is Trumpism—is based on the Westside of Los Angeles. More damning still, many of the leading figures applying Trumpism to federal governance have deep California ties. Among these are top White House strategist Steve Bannon, who lived for many years in Los Angeles while working in Hollywood; top Trump policy aide Stephen Miller, who is from Santa Monica; Breitbart immigration writer turned presidential special assistant Julia Hahn; influential Trump national security official Michael Anton; and UC Irvine economist Peter Navarro, now helping Trump un-make the global trade system. And more broadly, as Jason Willick and James Hitchcock showed in The American Interest, California thinkers—including billionaire Peter Thiel, the Hoover Institution’s Victor Davis Hanson, the Bay Area entrepreneur and political provocateur Ron Unz, the neoreactionary software developer Curtis Yarvin, journalist Mickey Kaus, the blogger Steve Sailer, and much of the roster at the conservative Claremont Institute—have helped build a case for Trump’s disruptive, anti-immigrant nationalism. The leap from this roster to the idea of Trumpism as California product involves many competing narratives, most of which divide into two camps. Those who dislike Trump point out that Trumpism draws from various historical strains of prejudice that California incubated. To name just a few of our notorious innovations: California developed some of America’s first and worst anti-Chinese laws in the 19th century; California was a leader in the indefensible incarceration of people of Japanese heritage during World War II; the California legislature started persecuting people for “un-American activities” before Joe McCarthy; and we were a hotbed of anti-Mexican prejudice and anti-immigrant politics throughout the second half of the 20th century. Even today, our most high-profile industries—Hollywood and Silicon Valley—practice exclusionary policies, visible in everything from the paucity of minority leads in films to the sexism in the executive suite at Uber. This blanket condemnation of California prejudice by anti-Trumpites has also ensnared L.A.’s toniest private school, Harvard-Westlake, which, despite producing civic-minded Angelenos (like Mayor Eric Garcetti) has taken publicity hits for graduating Hahn and Breitbart editor-in-chief Alex Marlow. The liberals in charge here really do have feet of clay, prejudice remains too present here, and the state faces all kinds of challenges … But we also should assert our hard-earned success: California has made profound progress over the last generation in becoming a more inclusive place. The Trumpians themselves have gone even further, justifying their own white nationalism as a form of rebellion against California’s supposedly tyrannical liberalism and stultifying political correctness. Miller railed publicly against diversity programs at his own Santa Monica High; Bannon has publicly taken the presence of Asian American CEO’s in Silicon Valley as some sign of a breakdown in American civil society. To them, California is a way of justifying their own bigotry. It’s tempting to dismiss such poor logic as, well, let’s just say you’ll find plenty of it in a Hanford dairy after the cows have had a good feed. Most children know that it’s wrong to blame one’s own poor conduct on the conduct of others. But the “Trump as California product” arguments, while bogus, touch on just enough truth that they deserve a more impassioned response. That response starts with acknowledging the reality of California’s history, and the many problems of the present. The liberals in charge here really do have feet of clay, prejudice remains too present, and the state faces all kinds of challenges, particularly in infrastructure, housing, and schooling. But we also should assert our hard-earned success: California has made profound progress over the last generation in becoming a more inclusive place. It was not easy—we had to survive the worst urban riots since the Civil War (Los Angeles, in 1992) and divisive ballot fights over immigration and affirmative action measures that carry echoes of today’s Trumpism. Now, despite predictions from the left (especially the writer Mike Davis) and from Trumpist thinkers on the right that a diverse California would come apart, our state is better off by every measure. As we became more diverse, our inner cities became safer. Our valleys became less polluted. And our people became richer and better educated. California is thus the most effective rebuttal of Trump’s false and bigoted claims that American inner cities are full of violence, that immigrants bring danger and voting fraud, and that foreigners are taking American jobs. Why are the Trumpians so fixated on discrediting California? Because we keep proving them wrong. Of course, our homegrown Trumpians, being Californians, don’t give up easily. And so they continue their preposterous strategy of launching rhetorical war on California on every front, from health care to environment to transportation—while blaming the war on California. It’s tempting to call such people traitors to California, but that would give them too much credit and feed their overdeveloped sense of victimhood. They’re really opportunists, who irresponsibly scapegoat a whole state for its bigotry when their own bigoted appeals have elevated them to power in Washington. Indeed, to blame California for Donald Trump is akin to blaming Abraham Lincoln for John Wilkes Booth. Lincoln had his own prejudices and he sure was unsettling to people. But only the most dishonest and unreconstructed Confederates would dare claim that he turned the gun on himself. California has its problems and prejudices. But that’s no excuse for Trumpians to put their crap on our home state.